Introduction: Hyde has been known in the fly-fishing arena to raise the bar beyond what is expected from a typical drift boat. 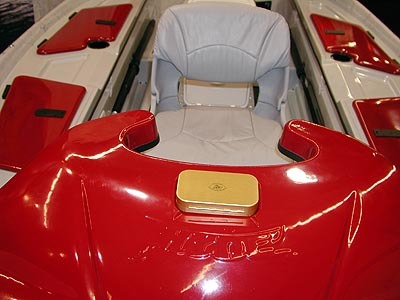 In 1993 they introduced their first combination Fiberglass/Aluminum drift boat that has become one of the most versatile drift boats in the industry. Recently, the adaptation of Hyde�s G4 bottom introduced a stronger more durable bottom. This year they impressed anglers with a new LH signature series drift boat that offers more compartment space and customizations than we have ever seen before. Impressions: A lot of times when you think drift boat you imagine a banana shaped shell, with little to no amenities. Function over form, these boats get you to prime fishing destinations, but are just about as utilitarian as they come when compared to other watercraft. Hyde changed all that by delivering drift boats so chock full of features, these boats are truly unique. Unlike any other boat available on the market, the LH Signature Limited Edition offers side storage throughout the boat allowing walk-through space on the interior. From its incorporated fly boxes to the new G4 bottom, every detail in this boat has been designed for the Fly Fisherman. �We wanted to create a drift boat that allowed fisherman to move throughout the boat without stepping over the rower bench, while keeping the storage space that Hyde drift boats are known for,� said LaMoyne Hyde, owner Hyde Drift Boats. We had an opportunity to preview this high end drift boat at the ISE 2004 San Mateo event earlier this month, and we were impressed with the design and engineering that went into all the Hyde boats shown....especially the LH Signature Edition. What is G4? : Many anglers that have shied away from completely non-aluminum boats often do so because of concerns about durability when the boat comes in contact with potentially hull damaging river bottom obstructions. 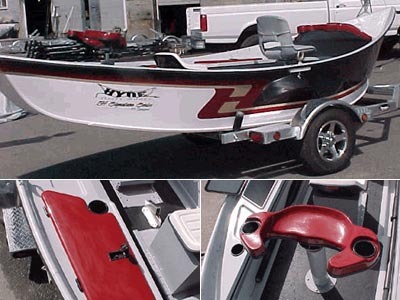 Hyde pioneered what they call G4 technology to dramatically increase the amount of abuse a drift boat can take. When we felt the surface it felt extremely slick to the touch. In demonstrations Hyde actually encourages skeptics to hit the bottom of their boats with a hammer! Needless to say after a few strikes we were believers. The G4 bottom is actually formed to fit the bottom of the boat, and can actually be sold as an accessory to fit any older boat! 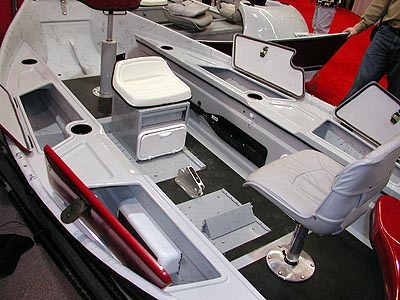 Features that stand out: The 2 most impressive features of this boat are the new compartment spaces available. 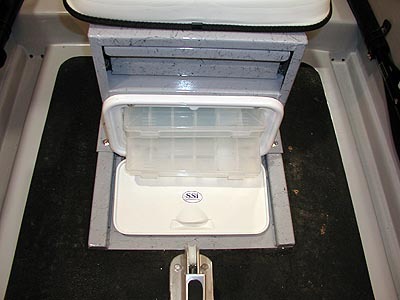 With the custom spare oar holder, slide out tackle trays, rope compartment, and recessed rod holders capable of holding 4 10� rigged rods, the compartment space available on this boat is far more than that of a typical drift boat. �Imagine being able to adjust your position to fit your exact circumstance on the river and to change that position again and again as the river changes its course and you begin to see the power of this revolutionary design,� said Lamoyne Hyde. 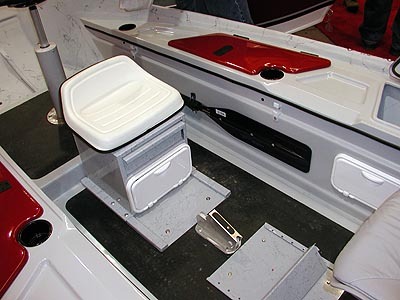 This new 360 degree swivel seat can be locked in to the desired position to side drift either side of the boat while standing up, or face forward. As if that weren�t enough rotate it 180 degrees and you now have a seat that can raise or lower depending on your height. Conclusion: The LH Signature Series redefines what fly fisherman can expect from a drift boat. No longer do you need to be satisfied with just a floating shell, these boats are more akin to bass boats, full of rod holders and tackle storage, all ergonomically laid out to improve your chances of catching fish. Breakthrough designs like the G4 bottom and the 360 degree seats merge comfort with functionality never before seen on a drift boat before. While the Hyde LH boats are certainly not the cheapest boats out there, they do set the bar when it comes to quality and innovative design. Hyde is so confident that their boats will stand the test of time they even offer a Lifetime Limited Warrantee on the LH Signature Limited Edition version. We look forward to testing this actual boat in action and judge for ourselves just how well these features aid to the overall fishing experience. Stay tuned for an in depth field test and review, but from what we have seen thus far it looks like Hyde just set the bar another notch higher.